There are three options to consider should a water leak be found under a slab. Before settling on any option, however, it’s best to know what caused the leak. One big cause is incompatible soil: soil with an ingredient that produces a chemical reaction that comes into contact with copper known as electrolysis. This may happen within several months or several years after the installed occurred. Whatever the case may be, the best thing to do is to completely replace the slab copper water lines. This is when piping comes into contact with the other exposed lines – heating duct work, electrical conduits, etc. Water lines – especially hot water lines – can move around because of the temperature changes and the expanding and contracting it does. The movement leads to friction that eventually wears through. Another possible issue is a kinked line or a workman nicked line (concrete workmen). The pipe’s indentation will, in time, wear through because of the moving water’s force. While it can take several years, it can happen. Still, you have to learn what’s causing the leak and this can be difficult to do. Okay, so you know you have leak. How do you go about finding out what’s causing it? One surefire way is to use a jackhammer on the slab and watch the cause in action. This is typically the most inexpensive repair too. Still, there are cases where the leak is under an expensive item that you’ll have to replace – shower, bathtub, tile floor, bath cabinets, kitchen cabinets or post tension slab. In these cases, rerouting the aberrant segment above is needed. Yes, this will cost more than your jackhammer and repair method but it’s far less expensive than your alternative – replacing tile floor, tub, etc. In every case, it’s best to get rid of all water piping under the slab once the leak is present. 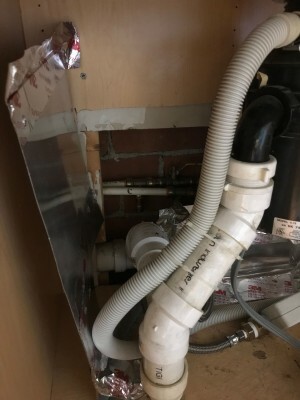 Of course, in situation where it’s been quite a few years since the initial installation, no continuous issues in the area and the initial leak is on the cold water line, it may be a good idea to go with the least expensive method. When insurance will cover the work, it’s best to keep the deductible in mind. After more than one or two slab leaks, you need to consider the total replacement cost. Add the deductible up, how much money is being unnecessarily spent and the inconvenience of partial parts. Yes, all situations are not the same. It’s best to hire experienced, knowledgeable workmen to do the job so it’s done correctly the first time around. They’ll look at the various alternatives and should discuss with you the best course of action that you should take. It’s less expensive to loop soft copper from the service to the fixtures than to run the lines above the grade into the attic or between the floors. There’s no drilling, strapping protection needed and not a lot of material being used. When water is in use, people can hear it in the overhead water lines. For some folks, this can be rather annoying. Other than using soundproofing walls and ceilings, not much can be done about this. Water lines that are in the attic are exposed to extreme temperatures – heat and cold. Cold water lines in an isolated area will take several minutes to bring cold water to the faucet. Hot water lines should be insulated to keep heat loss from happening. It’s far more difficult to keep temperature levels steady on cold water lines because insulation has very little influence on motionless water line baking in 140-degree heat. Installation of attic fans can help. The majority of folks have little issue with handling the increase in noise and temperature on the cold water lines. However, this should not be a factor when trying to decide what method is best. Slab leaks can be annoying. However, with a little bit of research and with the help of skilled professionals, you can get control over your slab leak for a reasonable price.